Description: High pressure sanitary shell and tube heat exchangers. Highly efficient designs, with shell diameters ranging from 3/4" to 2" produce heat transfer rates up to 60kW with flow rates up to 1000L/hr. 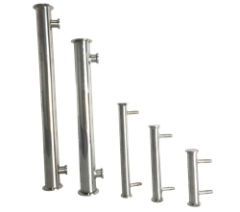 High pressure sanitary shell and tube heat exchangers. Highly efficient designs, with shell diameters ranging from 3/4" to 2" produce heat transfer rates up to 60kW with flow rates up to 1000L/hr. A connection 1/2" 1/2" 1/2" 1" 1" 1"
B connection Pagoda Pagoda Pagoda 1/2" 1/2" 1/2"